Even though Amber is eating wheat again, her intestines still do not tolerate much fructose and we have to watch every ingredient in store bought items. Graham crackers generally have been a problem for her with the honey and molasses the store bought versions usually contain. We found a fantastic gluten-free version at GlutenFreeOnAShoestring.com that we modified to make low-fructose friendly and have been successfully using for years. 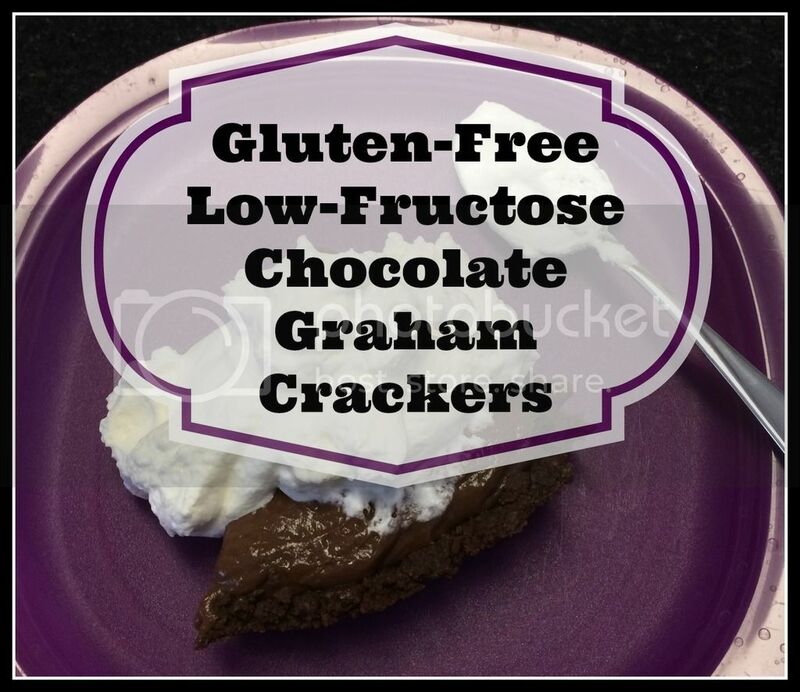 We've even crumbled the crackers and used them as a base for low-fructose chocolate pie! These crackers are probably my absolute favorite chocolate graham crackers, ever. I thought these would be more difficult to make than they actually are. I know it involves rolling out dough, but the dough doesn't need to be thin like for regular crackers, which makes it infinitely easier to handle overall. Preheat your oven to 325 degrees F. Line rimmed baking sheets with unbleached parchment paper and set them aside. In a large bowl, place the flour, xanthan gum, cocoa powder, maple sugar, granulated sugar, salt, baking soda and baking powder, and whisk to combine well. In a separate medium-sized bowl, place the shortening, beaten egg, vanilla and the maple syrup and mix. Create a well in the center of the dry ingredients, and pour the wet ingredients into the well. Mix until the dough begins to come together, then kneed by hand until smooth. - I don't use my stand mixer for this dough because it is too stiff. I mix with a large spoon until it comes together and then kneed the dough by hand until it is smooth. Divide the dough into two pieces, wrap one in plastic wrap and set it aside. Roll out the remaining piece of dough between two sheets of unbleached parchment paper into a rectangle that is roughly 1/4 inch thick (no thinner). I like them a little bit thicker, personally. Remove the top piece of parchment. Cut into 3-inch by 4-inch rectangles. Gather and reroll the scraps. Carefully transfer the rectangles to the prepared baking sheet and place the rectangles less than an inch apart. They do not spread at all during baking so you can squeeze them together as needed. Pierce each rectangle about 6 times with the tines of a fork. Place the baking sheet in the center of the preheated oven and bake for 10 minutes. Allow them to cool completely on the baking sheets before removing them or they will break - seriously, completely cool. They are kinda flimsy until they are cool. I usually make a double batch of these crackers each time because they are devoured quickly in our house! For a chocolate pie, it does take almost an entire batch to make enough crumbles for the crust.